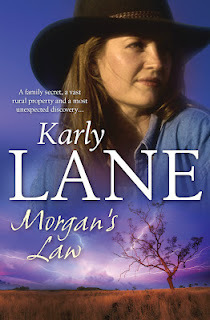 Today’s Mouthwatering Moment excerpt is from MORGAN’S LAW, by Karly Lane, published by Allen & Unwin. “I’m beginning to wonder that myself,” he muttered. “Do you want to just tell me what you’re talking about?” she suggested. “Considering I’m the only one who’s having a conversation while you keep talking in riddles –” she’d barely gotten the words out when he let out a low growl and leant closer, his mouth effectively putting a stop to her argument. He’d kissed her before and it shouldn’t have come as any surprise, but the same electricity that had stolen her breath away the first time had doubled and she was certain something was very wrong with her. Her heart was racing and as she tried to force her brain to work, she was fairly certain she could no longer feel her toes. Maybe it was a stroke? When he eventually pulled away from her and stared down into her startled gaze, she saw that he was also not unaffected. “Oh.” Oh? She worked with words for a living and had a degree for Gods sake, and that was the extent of her vocabulary? Karly’s favourite meal: With the cold weather creeping in, I’ve been having cravings for Lamb shanks! They would have to be my favourite ‘comfort food’ in winter. Karly’s favourite drink: A Margareta! The best ones I’ve ever had are served at a restaurant we go to in a fish bowl sized cocktail glass! Karly’s favourite treat: Sara Lee icecream….Oh. My. God. A BIG thank you to Karly for sharing her excerpt! Posted on May 3, 2012, in Excerpts, Mouthwatering May and tagged author interviews, books, excerpts, karly lane, Mouthwatering May, Mouthwatering Moment, rural fiction. Bookmark the permalink. 12 Comments. Wow, nice to know what I have in store for me when I get further into the book ! Oh bummer… a bit of a spoiler then for you Michelle!! Hope you enjoy it! 😀 I’m excited and nervous at this news Rachael!!! Nothing to be nervous about!! Thanks for being on the blog, Morgan’s law sounds like a great read! I have my copy too – must get reading! The best dessert in the world is ice cream. Everytime the mood struck you, ice cream is the best medicine. I like strawberry vanilla. My favourite ice cream is Walls’ Magnum almond. If the weather is cold, try to eat meatball with lots of chilli and for the drink is hot chocolate milk. i’m sure it will warm up your body. I agree Juliana- you can’t go wrong with icecream.. there pretty much isn’t a bad flavour!! !